NEW YORK, New York, June 13, 2017 (ENS) – The global investment banking, securities and investment management firm Goldman Sachs today took a step towards fulfilling its commitment to supplying the firm’s global electricity needs entirely with renewable energy. Goldman Sachs signed a long-term Power Purchase Agreement with a subsidiary of NextEra Energy Resources, which will add new renewable energy capacity to the electricity grid. The agreement will enable the investment in and development of a new 68 megawatt wind project in Pennsylvania. Once operational, it could result in the reduction of more than 200,000 tons of greenhouse gas emissions a year. Goldman Sachs is committed to using 100 percent renewable power to meet the firm’s global electricity needs by 2020, which enables it to achieve carbon neutrality while supporting the expansion of renewable energy projects. The Power Purchase Agreement is a collaborative effort between Goldman Sachs’ commodities trading group, J. Aron, and its Corporate Services and Real Estate department. J. Aron is acting as an intermediary for the project, providing commodity risk management and commercial expertise for the transaction. “By leveraging the firm’s intellectual capital and J. Aron’s expertise in power markets, we were able to structure the agreement in a way that allowed us to meet our operational and sustainability goals through a creative market-based solution,” said Blankfein. NextEra Energy is currently the largest owner and operator of wind turbines in the United States, and second in the world after Iberdrola. NextEra Energy owns and operates enough wind farms to power a city the size of Chicago, nicknamed the “Windy City.” The Florida-based company’s wind energy capacity has grown four-fold over the past decade. In 2015 alone, the NextEra Energy wind energy portfolio grew by some 1,200 MW. 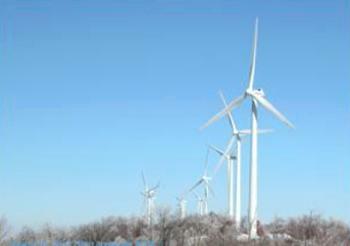 The company added nine wind farms in California, Colorado, Kansas, Oklahoma and Texas, and four additional wind sites in Ontario, Canada. NextEra Energy now has wind projects in 19 states and four Canadian provinces, representing a total capital investment of more than US$20.3 billion and a fleet size comparable to the generation capacity of a top-15 utility. “We are pleased to advance our partnership with Goldman Sachs and help it achieve its renewable energy goals,” said Armando Pimentel, president and chief executive officer of NextEra Energy Resources, the world’s largest generator of renewable energy from the wind and the sun. “This partnership demonstrates how forward-looking companies like Goldman are re-thinking their energy use, and leading the way with their investment in low-cost, clean energy that is both good for the country and good for their customers,” said Pimentel. Renewable energy accounted for the majority of new installed global energy capacity in 2016, according to the International Energy Agency, and Power Purchase Agreements by corporations in the United States have totaled close to six gigawatts since 2015. Goldman Sachs is a member of the RE100 initiative as part of the corporation’s commitment to increasing awareness and in support of global best practices for renewable energy procurement. RE100 includes 96 corporate entities committed to 100 percent renewable energy. Goldman Sachs is also a member of the Business Renewables Center, which seeks to accelerate corporate purchasing of renewable energy. “We have a dedicated green operational investment budget, which brings greater focus to initiatives that reduce our environmental impacts and enables us to invest in green buildings and innovative green technologies. We are targeting $2 billion in green operational investments by 2020,” said Dino Fusco, global head of corporate services and real estate. The Goldman Sachs Group, Inc. is a global investment banking, securities and investment management firm that provides a wide range of financial services to a substantial and diversified client base that includes corporations, financial institutions, governments and individuals. Founded in 1869, the Goldman Sachs Group is headquartered in New York and maintains offices in all major financial centers around the world.